".. 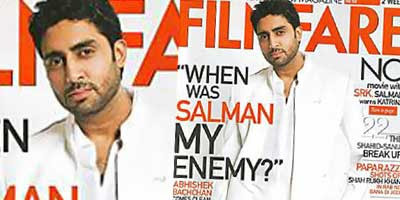 When was Salman my enemy?" screams the latest issue of Filmfare magazine as Abhishek Bachchan pose in all white suit (wonder where his trademark Drona costume went). Looks like he opened his big mouth. He comes clean on Aishwarya, controversies and political conflicts - what was so dirty before? Here is the preview, grab the magazine for actual clean up talk!